Mom's Gone Bronson! : Home-Made "Go Bronson Bean Burgers" on Home-Made White'N'Oat Rolls! Recipe! Home-Made "Go Bronson Bean Burgers" on Home-Made White'N'Oat Rolls! Recipe! Quite regularly we eat bean burgers in our house because my husband would prefer not to eat meat. 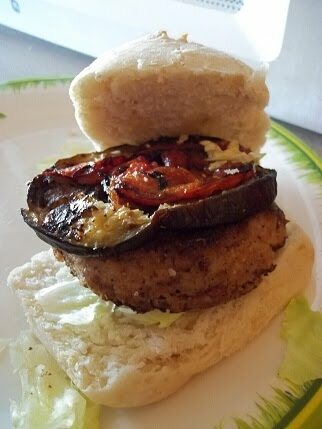 Tonight I went all out and baked home-made breaded bean burgers on a bed of lettuce, topped with roasted tomato and eggplant, served in a home-made white'n'oat roll, with a side of lemon pepper rice and corn. You're going to both LOVE me and HATE me for the way I cook because I don't always measure the ingredients and so I can only give you an estimation from which you can base your recipes and work with them until you get a consistency and taste that you both enjoy AND want to make over again! No two dishes of mine ever taste quite the same and this is always part of the fun! **You do NOT need to add salt at all but you can put in a little sugar if you'd prefer a sweeter bread. Making this bread could not be easier! 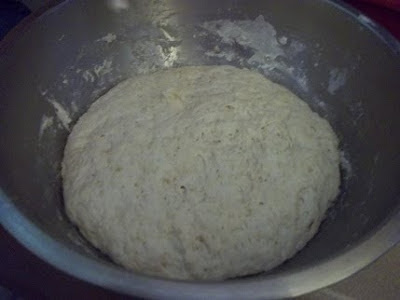 Simply place your flour, oats and dry yeast into a large mixing bowl and lightly combine. Add your oil and pour in your HOT water a little at a time so that you may stop when you have the consistency you seek and as not to end up with a wet mess! I usually stop when I am able to roll the dough into a ball without it sticking to my hands, but after it has enough moisture so as not to crumble! Now that you have your basic bread mixed, just leave it alone! That's right! Do absolutely nothing to your dough! Just cover over your mixing bowl with some saran wrap/cling wrap and put it somewhere warm in your house and walk away for around about 3 hours until the dough has risen to about 2 to 3 times its original size, at which point you will be ready to go! While the bread is rising you will have time to put together your bean burgers, prepare your vegetables and grab yourself a cup of tea! Maybe even throw in some housework, wash your dishes or read a chapter of that book you were planning on reading for the last 6 months but have yet to pick up! The choice is yours! Just remember, if you do put together your bean burgers at this stage, it is prep only! You do not want to cook your bean burgers before your bread is ready, unless you already have buns for them, in which case, go ahead! OK! So you have been busy for the past 3 hours but now it is time to get back to your bread, so grab your mixing bowl and remove the wrap from the top! Your bread should have risen substantially a should have a springy, elastic consistency! If you would like, at this point, you could kneed your bread and set it aside again for another hour or two, but I rarely feel a need to take that step and so it is your choice based on your preference! 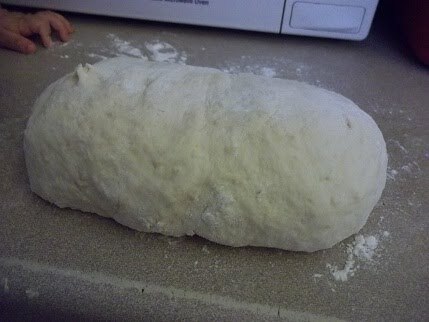 Now, lightly flour your counter top and place your dough on it - fold the dough once, turn it over and fold it again, gently, and let it sit for 10-15 minutes to rest and rise a little again. 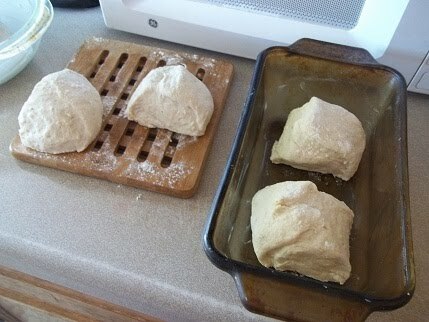 When ready, gently cut through the dough in the middle and then slice each half again twice to make 8 individual rolls. 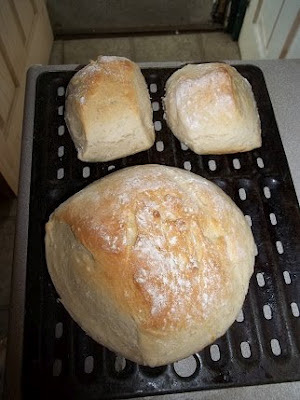 Today when I made these I made 4 rolls with one half and used the other half to bake a loaf so change it up where you like and make it as you need it! Place the dough into a bread pan of any shape or size, it really doesn't matter if you don't have the right pan, just make it up as you go along like I do! Score the top of each loaf or roll so that it might expand to its full capacity in the oven and sprinkle with a little flour! Bake in the oven on 350 degrees until lightly golden on top. Remove from the oven and set aside to cool. When your bread is cool to the touch, you can slice it, dice it, use it as you see fit! You could even toast up some breadcrumbs and throw those on your bean burgers to avoid having to buy store brought breadcrumbs! Voila! You just made some tasty bread! 1 can of any kind of beans of your choice! This should yield 4 very generous sized burgers. You can make them bigger or smaller, fatter or thinner to suit your taste and to stretch it out a little if you desire! There is no right or wrong in cooking! For garnish you will need 4 slices of eggplant, 4 slices of tomato, some shredded lettuce and condiments of your choice! Open your beans, drain a little, but keep some of the "juice" for moisture and to avoid a dried up burger when cooked! Mash up the beans a little but do not make them into total mush! It is good to have some whole beans and half beans even, you do not want a watery burger even though you would like it moist! To the mashed beans you will want to add a pinch of salt and pepper and perhaps a pinch of chili or paprika if you'd like a little zing! Throw in your egg and gradually add in your breadcrumbs a little at a time until the consistency is somewhat pliable as you stir! You don't want watery burgers and I know I am starting to sound like a stuck record but if your burgers are too wet they will cook like mushy pancakes, HOWEVER, if you throw in too many breadcrumbs you'll end up with very dry flaky burgers so you really have to feel your way to perfect burgers and it sometimes comes with a lot of trial and error - but don't be deterred! You'll get it! When your mix is ready, divide into 4 portions and form them into burger shapes, patting them firmly so that they hold together. Dip them in a LIGHT coating of breadcrumbs and place on a plate to the side. These are now ready to fry!! Now that you have your burgers formed and your buns ready, you'll want to start thinking about bringing this together as a meal! I served mine tonight with a side of lemon pepper rice and an ear of corn. The lemon pepper rice is just seasoned with black pepper and lemon Adobo seasoning and ready to serve. Simple and delicious! You can put your rice and corn on a few minutes before you start your burgers and play those buy ear! Don't panic if one thing is ready before another, you can let any of these stand, covered to keep warm, ready to serve when your other elements catch up! You could always serve these burgers on their own with a few chips or fries or even a couple of onion rings, they really are a meal in themselves! Have fun with it and get creative! When you have your sides cooking, start warming up a little oil in your frying pan in order to cook your burgers. These will cook in the oven but they are likely to dry out! Cooking them in the frying pan, with a little oil, will solve that problem! Fry each burger one side until golden brown, flip and repeat with the other side. They should cook within 10 minutes on a medium heat but keep an eye on them and determine the right time based on your cooking equipment. Whatever you do, do NOT attempt to cook these in a deep fryer! This could be very dangerous and will not hasten the cooking time of your burger! While the burgers are frying off in the pan, you will want to start organizing your plate You might also want to put your tomato and eggplant in the oven on a roasting pan with a little oil and cook those off in the meantime too! If you have rolls ready from the bread you baked earlier in the day, grab one and slice it in half. Place a little lettuce on the base of the roll and get ready for the main event! When your burgers are ready, take one per roll and load it on top of the lettuce. 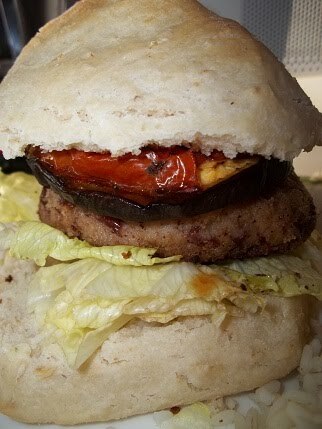 Grab your [now roasted] eggplant and tomato from the oven (without burning yourself) and load them up one slice each on top of each bean burger. I always think that placing the tomato on top of the eggplant makes for the best choice where asthetics are concerned! Add your bun top and you're done! You can add a little sauce or mustard to jazz it up a little if you would like and of course your sides! Here is what the finished product aught to resemble! Again, don't worry if it looks a little different, as so many variables can change the outcome of your presentation, but I can assure you that you're going to love them just the same! And there you have it! An easy-peasy hearty home-cooked bean burger served on your very own delicious home-cooked bread! I would love to hear from any of you that give this one a whirl and any alterations you make to jazz it up even more! The options really are endless!! **Disclaimer: This recipe is my own and I am in no way recommending any of the ingredients or endorsing any particular product. I was not monetarily compensated for this post. Please credit me if you copy/post about these anywhere else, thank you! Sounds super yummy! :) I need to try this! JFC Martha, this is all too much work, but it looks amazeballs. lol at the long disclaimer. Hahahah, what a great disclaimer! Thanks for typing all of the recipe out, we should try it on a meatless night in our house! Looks delicious. Thanks for sharing! I'll be bookmarking this one! Oh my goodness, this sounds delish!!! I have never had a bean burger, but they sound so easy, I'm going to have to try this. Thanks for sharing the recipe! Oh how I wish you would adopt me into your family after seeing this presentation! YUM! I love homemade food like this.